The Healthy Eating + Active Living (HEAL) Coalition for Maui, Molokai, and Lanaʻi has been involved in many events these past months. 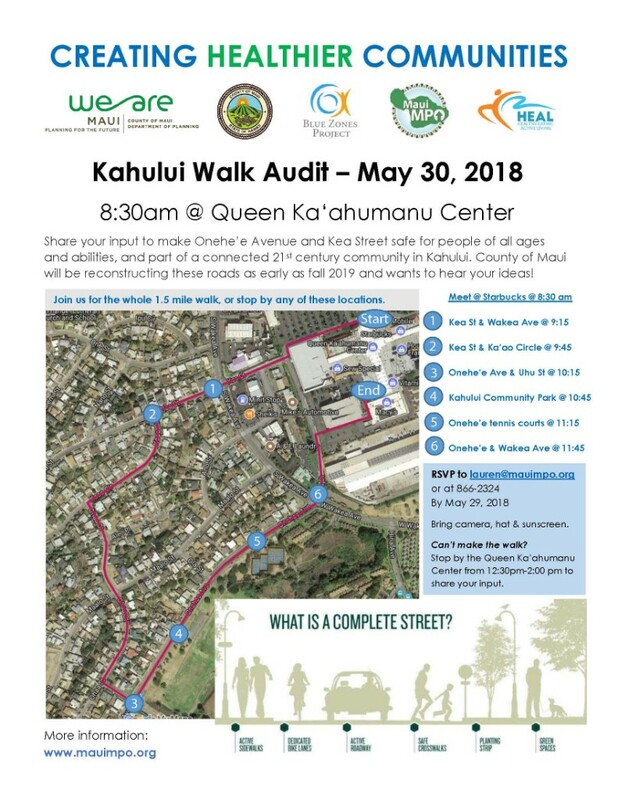 One event worth highlighting is the Creating Healthier Communities: Kahului Walk Audit that took place on May 30, 2018. This event was a true collaborative effort between The Hawai‘i State Department of Health, Maui Metropolitan Planning Organization, County of Maui Department of Planning, County of Maui Department of Public Works, HEAL, and Blue Zones Project. This event focused on complete streets and the built environment and allowed for an open discussion on progressive new ways to address issues that our County faces when looking at road and sidewalk design. We specifically looked at Oneheʻe Avenue and Kea Street in Kahului, which are scheduled to be repaved in 2019. The walk audit began at Queen Kaʻahumanu Center (QKC)and continued on to Kea Street, Oneheʻe Avenue, and Kahului Community Park. There were six stops along the way where the group discussed and scored the area based on four main topics: 1) mix of land uses; 2) network of facilities; 3) site design; and 4) safety & access for all. After the walk audit, the group debriefed to discuss the main themes that are issues with the two streets, and design ideas that affect pedestrians, bikers, and drivers. Action items were then discussed which will help inform the repaving of the two streets as well as future efforts to make improvements in the area. This event is one example of how the HEAL Coalition hopes to partner with other community partners to promote physical activity and connect built environment issues to community health and overall wellness. 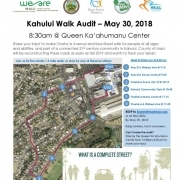 All of the partners who collaborated for this effort hope to host a community event and complete streets demonstration in Kahului later this year. For more information on the HEAL Coalition for Maui, Molokaʻi, and Lanaʻi, please contact the HEAL Community Coordinator, Lauren Loor, at lauren@hiphi.org.